Aquascape Prevent for Fountains prevents unsightly fountain conditions to keep fountains looking clean and clear while reducing maintenance. The treatment uses a special blend of clarifiers to clear and prevent debris and white-scale buildup in the water and on the surface of the fountain, rocks, or gravel. The formulation also works to prevent stains, foam, and other unsightly water conditions. 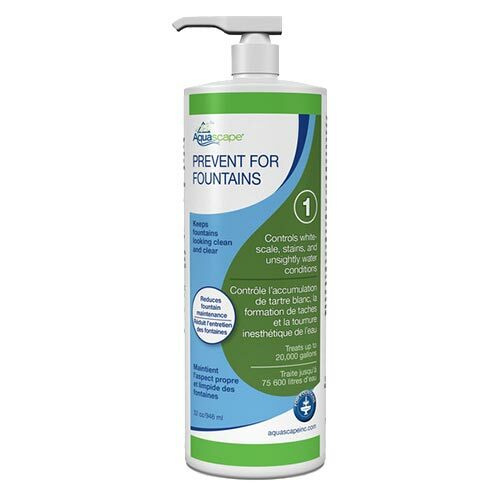 The easy-to-use pump top accurately measures 100 gallons of treatment per pump and the 8 ounce bottle treats 5,000 gallons total. Prevent for Fountains is safe for birds or animals that may drink from the fountain. Prevent for Fountains is not safe for fountains containing fish.